Blue font denotes premium content for Chimera Research Group subscribers. 6/23/11 Analyst Day - click for notes. 8/8/11 2q2011 webcast - click for notes. 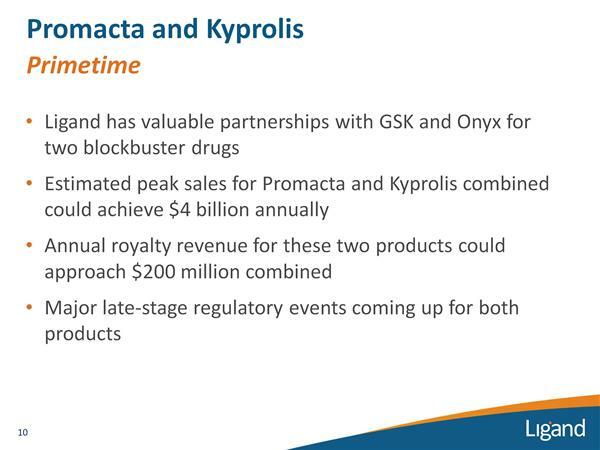 9/9/11 Stifel Nicolaus webcast - click for notes. 10/21/11 Biocentury webcast - click for notes. 5/2012 ASCO abstracts - click for blog. 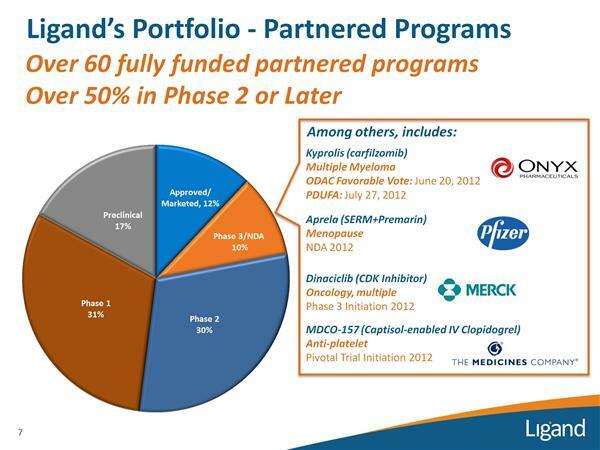 6/2012 Jefferies Healthcare conference - click for notes. 9/2012 Notes from partner 2q-2012 earnings calls - blog. Link to partnered and unpartnered pipeline charts. Combichem technology has hit targets that collaborators failed to w/ their own medicinal chem efforts. 11/2010: recd $2m IRS grants for 8 programs. 2011 Guidance: operating profit on $22-24m rev and $16-18m expenses, 35% COGS on material sales. YE2011 cash $10m w/o addl borrowing or partnerships. 50% capitsol material sales, 35% royalties (about $8m, $1m projected from Cydex), 15% licensing, etc (about $3.5m, $1.5m from Cydex). In 2012 the following core assets will be early in their revenue life cycle and are predicted to make up >$30m rev total - promacta, avinza, conbriza, nexterone, carfilzomib. 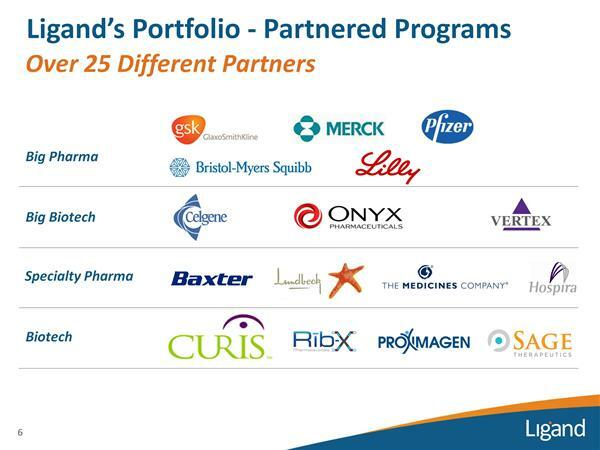 Click here to download 2/2011 BIO CEO conference summary document for LGND. "Shots on Goal" portfolio strategy slides. Internal Programs poster. Mentioned possibility of broad metabolic disease collaboration. Click here to download August 2011 Corporate Presentation slide deck. Click here to download September 2011 Stifel Nicolaus conference slide deck. Click here to download October 2011 BioCentury slide deck. Click here for November 2011 Griffin Securities initiation report on LGND. 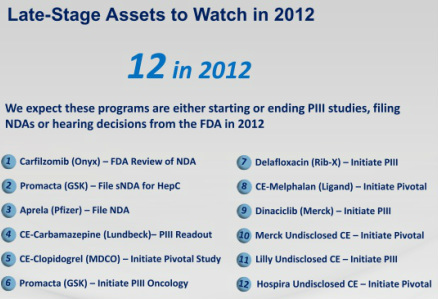 Click here to download February 2012 Citi webcast slide deck. 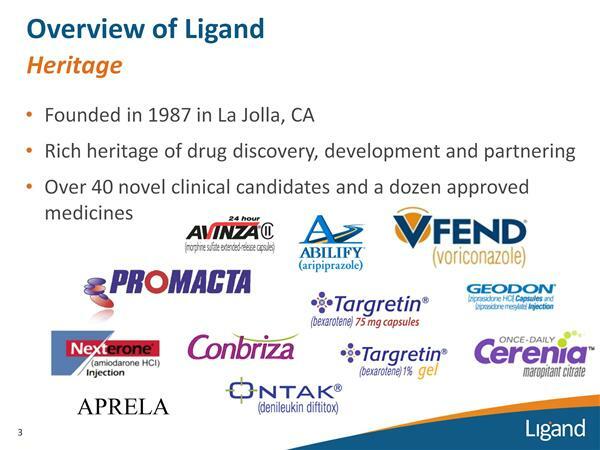 Click here to read March 2011 article written by Xconomy.com "For about $60 million in cash and about 15 percent of Ligand’s stock, the San Diego biotech has amassed over 60 new drug candidates, pharmaceutical partnerships, and other assets with a cumulative value that Higgins says is close to $2 billion"
Click here to read July 2011 RealMoney article about Ligand. Click here for March 2012 BioWorld feature on Retrophin, run by Martin Shkreli and which licensed drug from Ligand. Proprietary royalty calculations and forecasts for Avinza, Promacta, and other products are available to Chimera Research Group subscribers upon request.